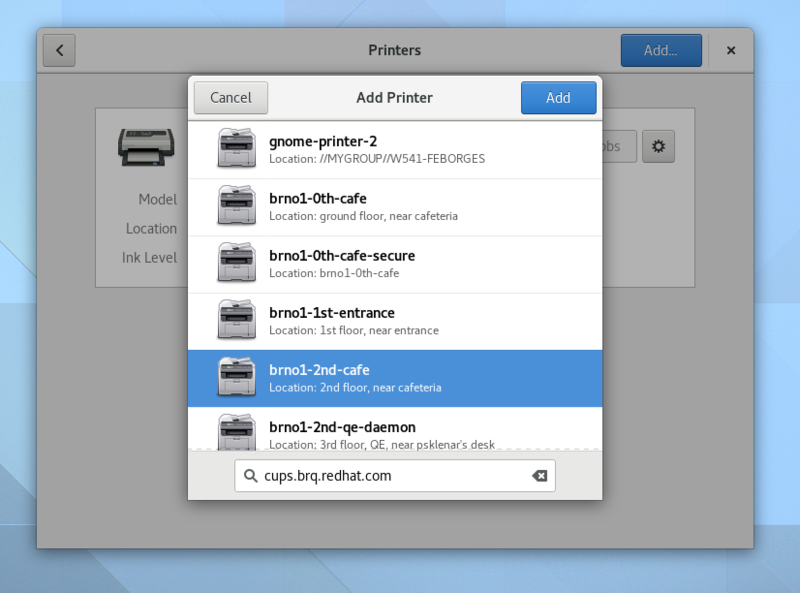 As I mentioned in my previous post about the New Users Panel, we are happy to be able to include a new Printers panel in GNOME 3.24. 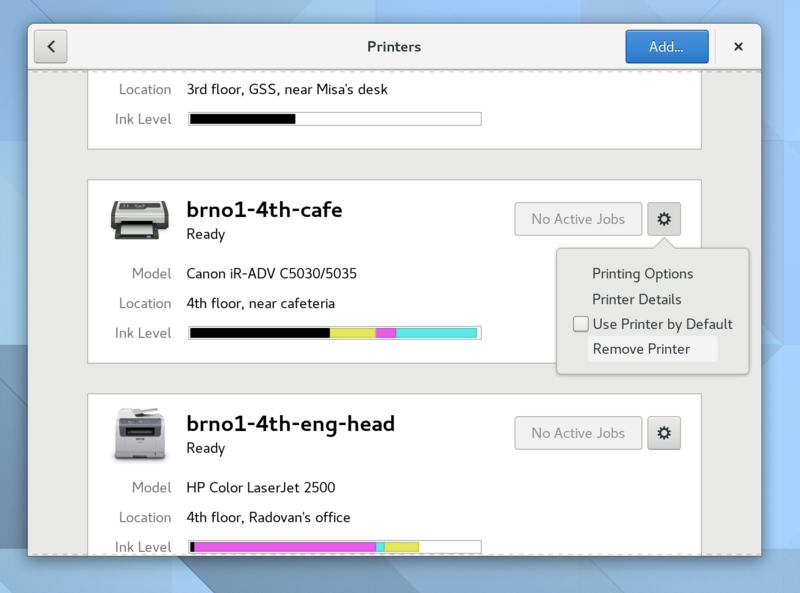 The Printers panel is also part of the GNOME Control Center redesign effort which intents to introduce the new shell in 3.26. The printers are now listed all in the same page in a single column. The minimalist look doesn’t mean that we dropped any features. Everything else is now part of the Details Dialog. 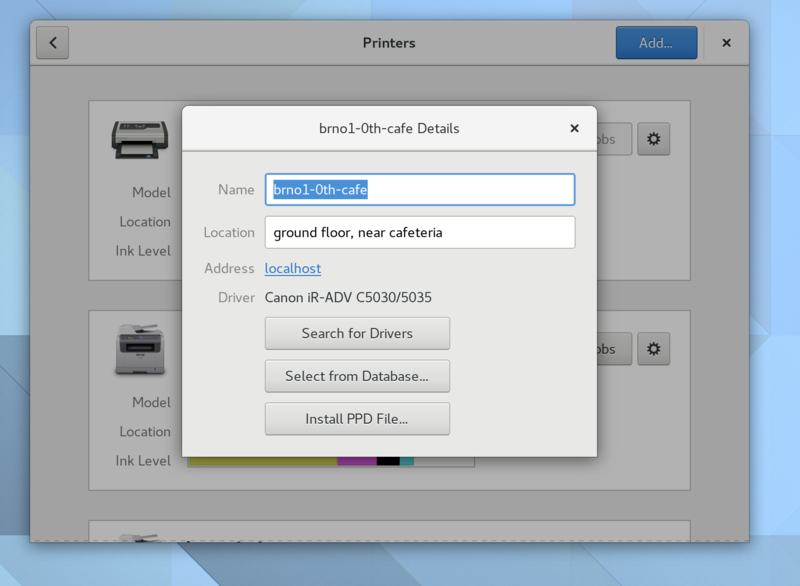 The gear button exposes the printing options dialog and the new printer details dialog. Also, let’s you easily set the printer as default or remove it. Adding a new printer is also cleaner. The new Add Printer dialog can handle authentication of printing servers within the dialog (instead of the extra authentication dialog that we used to have). These and plenty of other changes will be part of GNOME 3.24 which is going to be released in a month. Stay tuned! Will there be also a table-view? 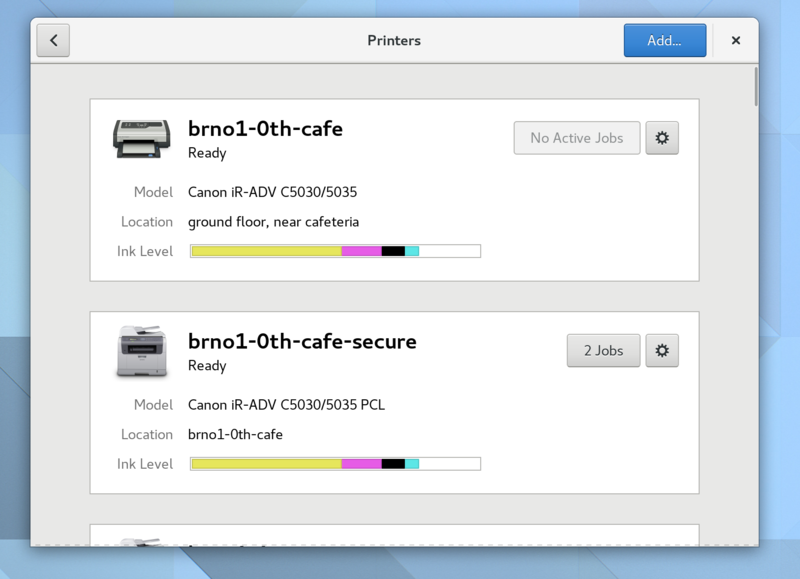 We have some 50 printers here ;-). Was the old treeview good enough for your use case? Maybe Search? What do you think? I’d go for search indeed. Specially if it’s handle nicely, as you type. Any chance to finally get smbclient optional, or would such patches be now acceptable? I don’t use printers but these screens look beautiful. I truly think GNOME is the most refined desktop. Looks good, thanks. Butting the ink levels against each other in a single box seems weird, I think separate boxes for each color would be more intuitive. And why do the ink colors appear in different orders, is the a way to normalize to black – yellow- red – blue? Typo: “let’s you easily set”. This isn’t a contraction (e.g. let us examine the printer panel -> let’s), it’s just conjugating the verb, so no apostrophe. Looks very good, but I’m slightly confused of how one should read the ink levels. Are they always relative? E.g. if I have 30% yellow, 1% magenta, 1% cyan and 1% black will I get the same visualisation as with 60/2/2/2? What does it mean for a single component to use more than half the space of the bar in the UI? In a multi-user environment, can the jobs button filter the queue results into (mine, others). I should be able to purge mine, but not others.